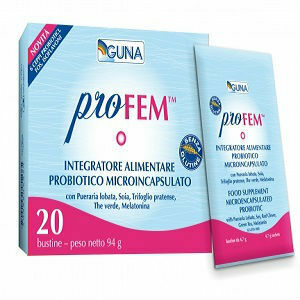 PROFEM, from nature, is a unique and complete formulation specific for the well-being of women in menopause. The product source did not make it clear if the herbal ingredients are included as part of the protein and carbohydrate ingredients listed above. The product source contained no information on daily product dosage (the product comes in individual sheets). The product source contained no information on product price. The vendor is based in Italy. The product source contained no information about product returns or guarantees. The product source did contain a vendor phone number. With so little information on the product provided in the product source it is not possible to give this product an evaluation or a recommendation. Any one interested in purchasing this product should contact the vendor directly for more information about the product including price. Jackie Horowitz	reviewed Guna International ProFem	on April 17th	 and gave it a rating of 2.